It's no secret that I love me some spray paint. Perhaps it's the giddy feeling that I get when I have to show my ID at the cash register. Who me? Over eighteen? What? You need proof? Because I don't look a day over seventeen? Gladly, kind sir. Or the quick and speedy nature of the project. Go outside. Spend a few minutes spraying on a thin coat. Go back inside. Eat a Cadbury Creme Egg. Repeat. But Mique (who is my most favoritest) knows me all too well. She put into a printable exactly what I think. Yes. With enough spray paint I could totally rule the world. It would be so colorful too. Check out more of her Together We Can Rule the World printables here. Mason Jars (inspired by this post) plus some sun yellow spray paint. I could have just stopped there, but instead I chose to do my civic duty by helping the city rid themselves some of their rampant wild daisies. Did you know that in all the world, a simple daisy is my most favorite flower? They are sunshine on a table, for zero dollars. If this little trio doesn't make your smile, I am so, so worried about you. There might need to be some therapy in your future. Just gather your jars, plop them upside down on a tarp, or piece of cardboard. Then lightly and evenly cover the outsides of each jar. Lighter coats are better - less chance for icky drips. Because the paint is on the outside, the flowers can rest in water on the inside. If your jars will get a lot of use, or will be transported, keep in mind that the spray paint might scrape off a bit. Either use spray primer first, or touch up with more paint as needed. In declaring my ongoing love for all things spray and paint, I would be remiss in failing to mention whom in the vast sea of painting choices, holds my heart the dearest. Rust-oleum Ultra Cover. There is no other brand that comes close. It has never, ever, ever let me down. Chances are, if you have had spray painting failures, it was the brand of paint's fault. Not yours. So go to Home Depot. Fall in love with happiness and success in a can. You will never be the same. Now go paint. And steal flowers. i'm totally a long time stalker of yours... but i don't think i've yet commented!?! Funny that you mention this today. I am planning to spray paint on the pots on my deck turquoise before I fill them with plants for the summer. I'm just waiting for a day that doesn't have 40 mph winds. i haven't hopped on the spray paint train yet. but i know once i do, i wont hop off. those mason jars might have been the ticket. 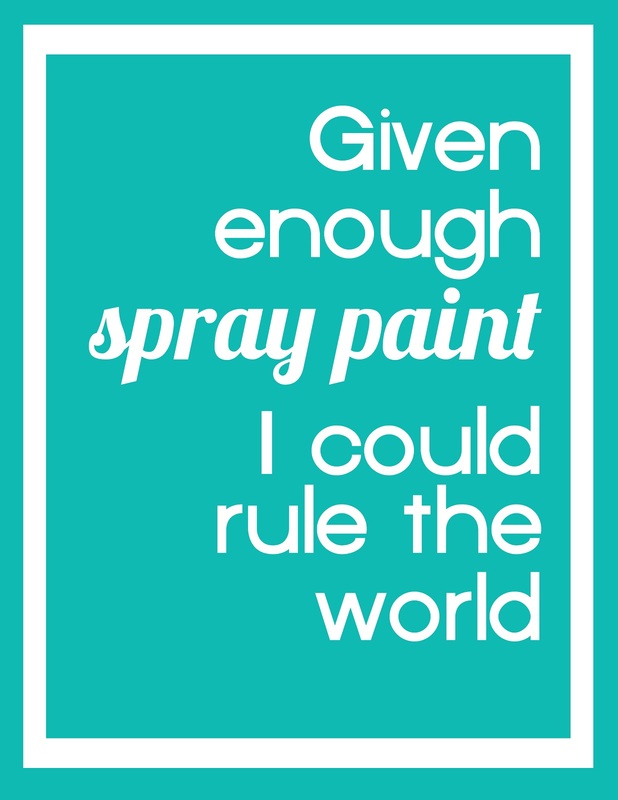 I love this post almost as much as I love spray paint! The jars are beautiful! I'm getting the spray paint bug. My daughter paints everything. Love, love the jars. I'm all over the daisys. I'm always happiest with wild flowers. i am dying right now. seriously, dying. OH MAN, i MUST get paint and whip me up some pretty mason jars!!! i already adore them..but in yellow! stooop it! soo good. Ok, you may have talked me into in :) maybe. Daisies were my wedding flower. Amen. Such a great idea. how did i never think of it? So happy. so cheap. I have a little obsession with spray paint too. glad to see i'm in good company. I love this ... it does make me smile :) ... and now I am wondering if I can actually bring myself to paint all the jars I have collected. I think so ... I gotta go buy some paint! My fav brand of spray paint too! I've got some awesome turquoise in my garage just screaming for my vintage metal glider on my deck. LOVE the jars and daisies too! I am going to paint my yucky old metal patio furniture the exact color in the middle of the paint can pic. The Lagoon color has stolen my heart for this summer...LOL! spray painting mason jars? GENIUS!!!! Reason #214 why I love you!!!! this is awesome!! i LOVE that you painted the mason jars....too cute!! yay for this post. and you're new nickname just became "sunshine." you're like sunshine incarnate and that's why you love yellow so much. Mason jars + painted bright yellow + daisies (my fave too!) = lots of smiles ... a wonderful equation! Thank you! I loved it! you are such a goofball. The mason jars are genius idea!! Must copy that. i love you more this moment than i did before! this idea is TERRIFIC! going to go inhale some spray paint fumes now. FYI: My wedding cake was decorated with daisies... my favorite too. Love it! Never spray painted anything but I do plan on trying it soon! seriously...genius. i'm always trying to find somethig new to spray paint. and i have these jars all over my house. goodness. never even thought about it. thanks! I so love spray paint !! It's the best thing ever invented for non crafty people like me. I am so not talented like my daughter(Heather Giustino of Angel Face Designs). So glad she is and all you ladies. Thank you for sharing your wonderful ideas. Hi. My name is Sarah and Im also a spray painting addict.Oh and I officially love you! Painting the jars? LOVE it! Oh my Julie - I JUST painted a bunch of things with the Rust-oleum Glossy yellow last week - Love, Love, Love the stuff!!!! i like you a lot lot...you make me smile everytime i read your awesome way of just talking about nothing and everything. Thanks for being so unique!!! then i talked about you. So, I tried it...not my table, thank God! Spray painted some Mason jars for my daughter's 3rd birthday party this weekend. Found out, I'm not very good and I think it takes a steady hand and a LOT of practice! May jars are a bit "drippy", but I'm still going to use them, hopefully no one will look to close! LOVE this idea of spray painting mason jars! I have a shelf in my laundry room cabinet FULL of spray paint but haven't been brave enough to try it yet. And I'll be the one to ask: Spray the jars on the outside since the inside will be filled with water, right? SEE! I told you I was chicken! Your jars are just the pop of spring color I need on my window ledge! Love the pop of color! 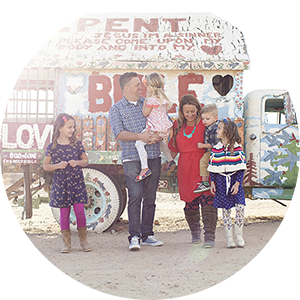 I'm including the in a post titled "Mason Jar Revival" on my site if you'd like to have a peek. Love the bright sunny color and daisies..def made me smile :) I am gonna have to give this a try! Thanks for the idea! I love your project and the daisy is my favorite flower too. I'm a really cheap date because I can't drink alcohol either. Hi there, LOVE this and LOVE ME SOME SPRAY PAINT too. Just wanted to let you know that I just launched a Rust-Oleum Linky and would love it if you would add this (and any other projects where you use Rust-Oleum products). 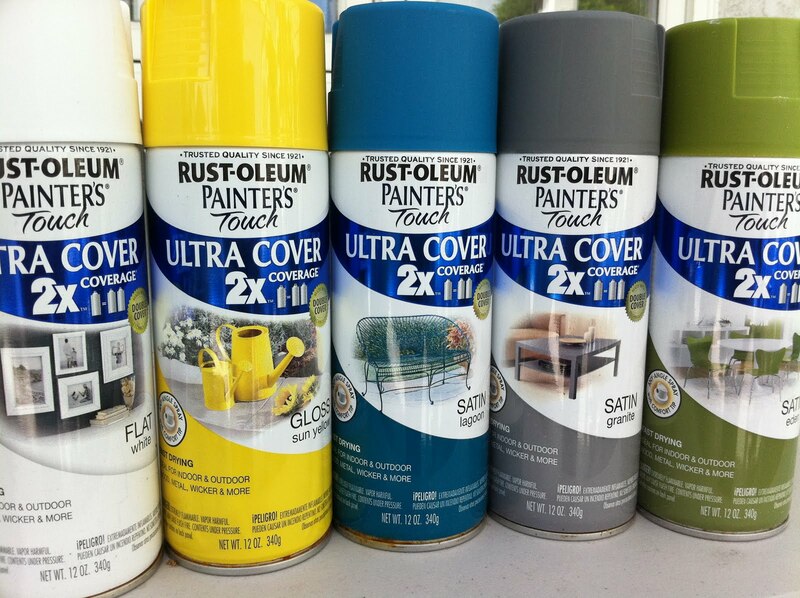 No hoops or rules just a little linky for Rust-Oleum Lovers. I would love to try the Rustoleum Painter's Touch Ultra Cover...but I can't find it. I've looked at Lowes and Walmart. Does anyone know where I could find it at? I love this painting. Awesome..
this may be a dumb question, but did you spray the inside or outside of the jar?? Love the idea, thanks, can't wait to try it!! I love these! Found you from a pin on Pinterest while looking for tutorials. Have been "trying" some spray painting myself, but with little success. I noticed that a couple of others asked already, but did you spray the inside or outside of these jars? You totally rock! I have a bunch of glass jars that I was "collecting" for a craft project...Now I know what to do with them. Hi there, I know this post is a little old, but I just came over from Meg's whatever blog after picking up a Sudan printable (thank you! ), and I decided to browse around your blog. :) I spray painted a lamp a while back (with gloss yellow paint... I think Krylon? I got it at Hobby Lobby). Anyway, it has a very sandy texture. NOT smooth and glossy at all. I was thinking I must have done something wrong. I used spray primer, but I didn't sand after the primer. Is that where I went wrong? Also, the direction said to hold the can 12 inches away (I think) and to do a second coat after 1-2 minutes, so that's what I did. My coats were extremely light. I ended up using two entire cans for one little lamp before I got the color to look right, and it is all sandy/gritty. Did I do it wrong, or could it really have been the paint? Sorry for such a long comment/question. :) I'm scared to spray paint anything else because of my sad little lamp. Hi Jenny, I know I am not the author of this blog but I wanted to help you. I am no painting expert but I have painted my fair share of furniture and accessories so I thought I'd offer a tip. What brand and finish was your spray paint? Not all finishes are the same. If it says "flat" it will have no gloss whatsoever, if it says "satin" it will have a bit of an eggshell finish, if it says "gloss" then you will get your glossy finish you are after. Do you still have your lamp? Maybe try lightly sanding it, then use a damp rag to clean off all residue, prime and use a new kind of spray paint. If the lamp is already imperfect to you you'll only be out a few dollars for the spray paint. Good luck, I hope this helps! I just have to tell you this is my first time on your page (found you through Pinterest of course!) and you are hilarious! I am laughing so hard! And I love the spray paint quote, I can totally relate! Thank you for the tips, I can't wait to try them. Have a happy day! Thank you thank you thank you! I am on my way to Home Depot as soon as I post this!! I just *tried* to spray prime something and half a can later it still isn't covered properly. My cat chuckled as the neighbor hound howled in mirth at my frustration. Home Depot IS open at 7 a.m. right?? Wow…….enormous blog. Thank you for sharing.